RadChart supports multiple axes. You can add vertical and horizontal axes per chart basis and per series basis. This means that if you have two series in one chart instance, you can use different horizontal and vertical axes for each series. Additionally, you can control their position through the VerticalLocation and HorizontalLocation properties, respectively, for HorizontalAxis and VerticalAxis. The image below illustrates a scenario in which we have two series - LineSeries and BarSeries. We will use a CategoricalAxis positioned on the Top and a LinearAxis on the Left for the LineSeries. 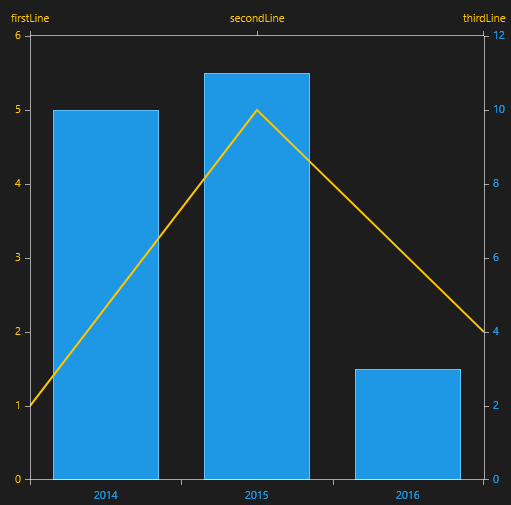 For the BarSeries we will use a DateTimeCategoricalAxis positioned at the Bottom and a LinearAxis on the Right.